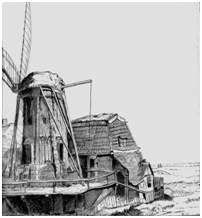 In fine art, the term 'pen and ink' denotes a drawing technique involving the use of black and other colored inks which are applied to a support (generally paper) with either a dip pen or a reservoir pen. This traditional, versatile media has been used by Western artists since ancient-Egyptian times, for sketches, finished drawings or ink and wash paintings. It is also one of the main mediums involved in book illustration. The development of ink truly revolutionized human life. Long before Gutenberg simplified the printing process, ancient cultures in Egypt, Greece and Asia used ink for creating handwritten manuscripts, religious and political documents and works of art. Ink provided people with a permanent means to keep records, create manuscripts and document the world around them. Ink as a sophisticated artistic medium developed sometime between the 7th and 8th centuries in China, where a range of subjects, from religion, history and daily life, were illustrated using brushes fashioned from animal hair and feathers. Applied to scrolls of paper or sheets of silk, these detailed works of art were forerunners to the approaching development of pen and ink drawings. By the Renaissance, new tools were developed to enhance the precision and detail afforded by ink, such as wooden styluses and sharpened metal shards. Because of its permanence, ink drawings demanded practice and perfection. For this reason, many artists used this medium for their studies. Leonard Da Vinci created many detailed studies of human anatomy, mechanical inventions, as well as figure drawings, which exemplify the range of results possible with fine ink drawing. Ink was also used with other media, such as pencil, graphite, watercolor and chalks, and soon washes and highlighting techniques developed, providing additional effects to ink drawings, whether quick sketches or elaborate compositions. Ink has been used for centuries to create meticulous compositions. In addition, realistic diagrams of the anatomy helped early doctors in the study of the human body. The printing of books advanced literacy and promoted language arts. As an artistic medium used by masters, such as Rafael, Rembrandt and Picasso, ink is a versatile medium that provides a permanent record of an artistic statement. Question: How many “Pen and Ink” drawings did Leonardo Da Vinci create? 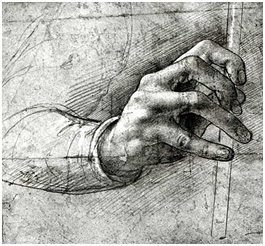 Answer: Leonardo composed a minimum of 4,000 “Pen and Ink” drawings.